Fight for It! – B is for Blessed! I enjoy watching birds, especially in the mornings while I eat breakfast. There is one red cardinal in particular who always escapes my camera. There is a wide array of wrens, thrashers and finches. The robins are new this year. I even think starlings have nested on my roof. All in all, my yard birds pretty much eat and live in harmony. And then there are the blue jays. Their arrival always seems to cause a ruckus of some sort. The normal chirps and chatter quickly morph into screeches and clamor with their visits. Yesterday was no different. However, this time I was able to view the scuffle first hand. The mockingbird is not a glamorous bird. It’s not brightly colored or even sings its own song. I refer to them as the town criers. They are always chirping about something. They are noisy. And nosey. No other bird bothers to come over and inspect what I’m doing in the yard. Yet, I will give them credit for one thing, they don’t back down from a fight. I’ve watched mocking birds chase away birds three times their size. I’ve watched mockingbirds dive bomb a cat too close to its nest. I’ve even had to duck one or two in my day. They are fearless. 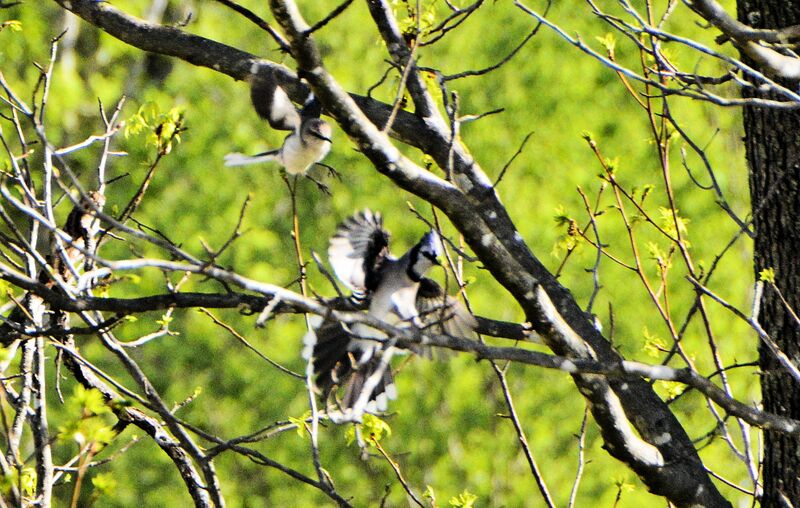 I watched for nearly half an hour as two mockingbirds chased two blue jays and essentially tossed them of my yard. They never tired or gave up. It gave me pause to wonder, why don’t we fight like that? Do we really fight hard enough to keep our peace and cut stress inducing conflict from our lives? How about fighting to protect our kids from harmful influences even when those very things are deemed the norm? I’ve had to fight to protect the progress I’ve made in certain areas of my life. Sometimes it takes all we have not to fall backwards into old attitudes and habits. I’ve fought to forgive and I readily admit it wasn’t easy! I’ve come to learn that to obtain those things that truly bless us, we will in some way have to fight for them. We may have to fight for a better education. A job. We might fight to keep our family together. We may even have to battle an illness. There are times we must fight people to keep them from stifling us. There are times we are forced to fight the enemy and not be deceived. At others, we must fight ourselves and every inclination to accept second best. And yes, there are even times we wrestle with God! There is often some manner of “fight” that precedes a blessing. If you ever watch a butterfly fight its way out of the cocoon, it often looks like it’s not going to make it. By the time it falls out wet and wrinkled, it looks like it has lost the battle. But moments later after a brief rest, it eventually stretches out its wings and takes flight! We must learn to look past the fight and toward the flight! If you’ve fallen, get back up! Fight like your life depends on it because it does. It won’t always be a fair fight, but with God on our side, we can finish our race and finish well! I can relate to your mother. I eat breakfast with a full view of flowers and birds, it’s a good way to begin the day. I remember you were looking after her before your “sabbatical” I hope all is well with you. Peace to you. You know, it is bitter-sweet when a prayer is answered sometimes. She was so little like herself for the past year or so, (the Alzheimer’s), and at times, even she realized that fact in some way. I had prayed that she be taken with as little or no pain as possible. She died almost instantly of a sudden heart attack…bitter-sweet! Thanks for letting me ramble a bit! We are all recovering with the knowledge that she is “perfect” in every way now and with her Lord! I knew there was a patch there when she wasn’t doing well, Steve but I wasn’t absolutely sure. I knew you stopped posting for a while to take care of her. I am very sorry for your loss. It sounds like you had a great relationship with your mother. I’ve had first hand experience with dementia and it is hard to see your loved ones slip away before your eyes. You are always welcome to ramble. It has been an “interesting” day but very much a blessed one. Thanks so much for stopping by. Peace to you! I just nominated you for an award here: https://annarosemeeds.wordpress.com/2015/04/14/an-array-of-awards/ Thank you for all that you do! Hey there, this got mixed in with a long thread of comments so I’m just finding this! Thanks so much for the nomination. I truly appreciate it. Thank You! Lilka – on first reading I sat back and thought “fight = anger – war – death and all that bad stuff”. Then He reminded of a time I fought tooth and nail (I hope it was always alongside Him) for something others accepted as “the norm” and had given up on. Boy was that a fight (in the context of your words and meaning). Thank you – you have allowed me to loop a few loops in my own thinking of that word “fight”. I’m glad you were able to loop back around to my intent. Simply put, I think we often give up without fighting harder for the important things in life. If someone tells you no, I’d rather we ask why not instead of blindly agreeing and our blessing never sees the light of day. There’s far too much anger/war/death stuff floating about. The intent is to build people up, not tear ’em down. 😉 As always, thanks for tuning in! Love this post. We often forget that fighting is necessary…we just need to be fighting against or for the right things. Love watching the birds at our feeders…such fun. Thanks for the much needed encouragement.